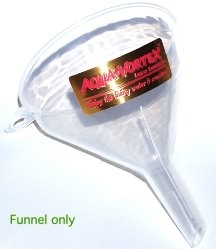 You do need a Funnel for the AQUA-VORTEX™ and the GoldAQUA-VORTEX Plus™ – here you can order the 4-inch funnel separately. The funnel which we supply is made from environmentally-sound Polypropylene(PP). It is PVC-free, heavey-metal-free, plasticizer-free, BPA-free, neutral, safe and strong. It only contains long molecules of the gas propane and some chalk. Even some body implants, ropes and drum sticks are made from PP because it is so clean, neutral, non-toxic, strong and durable. You can clean it with soapy water and, like the actual AQUA-VORTEX, the funnel is also dishwasher proof. Funnels are tested for migration and heavy metals in accordance with directive (EU)10/2011 ‘Plastic materials and articles intended to come into contact with food’ by the UK manufacturer.